As may be expected from the title and the cover, this non-fiction book is targeted at a specific audience: committed Christians, primarily those who belong to evangelical groups. Non-believers and adherents of other religions will find much to contest in the arguments put forward here, but I do not believe this book is aimed at them. Although my interest in it was based on a background in the study of moral philosophy and the philosophy of religion, my review is based very much on how one with unquestioning faith in God and Jesus and belief in the supremacy of the scriptures would react to it. 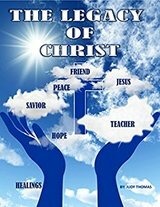 The author’s goal is to review the life of Jesus as depicted in scripture, and from this to draw lessons for everyday living. This is a task she achieves very well. The writing is simple and clear, and therefore accessible to all. As a young boy in Scotland, I was brought up in a similar Evangelical religious background and the book reminded me of my Sundays of Bible study and listening to sermons. Many of the lessons contained here would be helpful to Sunday School teachers. The book is a little bit more than this, however. The author recognises the difficulties of interpretation of the Bible, and makes a comparative analysis between various points of view. Some may find the arguments stimulating but controversial. For me, one of the biggest problems the world faces today is how those with very profound beliefs relate to others who do not share their faith. Of course, they cannot think those others can be anything but mistaken in their beliefs. But do they treat them as enemies or as lost souls awaiting enlightenment? I was pleased to note the tone of this book advocates the latter point of view, and for me it represents a valuable contribution to the universal dream of a peaceful word.